Hearing aid technology has improved to the point that most hearing aids are undetectable to the outside observer. 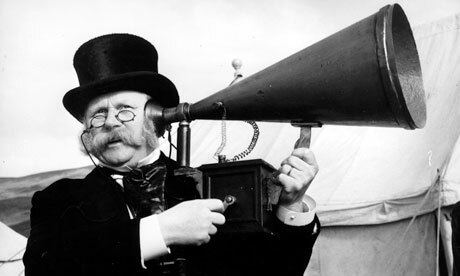 This is a far cry from the very noticeable ear trumpets of the 1800s. Some deaf people today also have the option of surgery to insert a cochlear implant – which can provide for some speech and sound recognition in formerly completely deaf people. Modern hearing aid technology has progressed from simple amplifying devices, to electric carbon, vacuum tube, and transistor models, to digital hearing aids. After the invention of electric hearing aids at the turn-of-the-twentieth-century, hearing aid batteries decreased in size so that modern hearing aids can be discretely worn completely inside the ear canal. Ear trumpets existed in the 1700s and were popular through the 1800s. These devices came in various shapes and sizes but all operated on the same principle. Before the invention of electricity, the only option was to attempt to capture, amplify, and direct sound into the ear canal. These devices were useful for people with mild hearing loss, but would have been of minimal use to the moderately- or severely-deaf. Electric hearing aids made their debut in the early 1900s, but the early models were expensive and cumbersome – including desktop models that had limited portability. These electric carbon models got smaller by the 1930s and 1940s, but the hearing aid batteries were still large and did not last very long. These early electric devices were only of use to people with mild to moderate hearing loss. 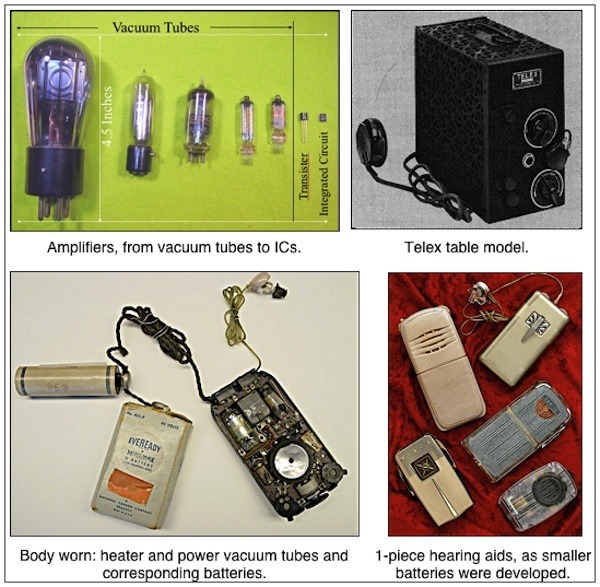 The 1930s saw the introduction of vacuum tube technology and its application to hearing aids. 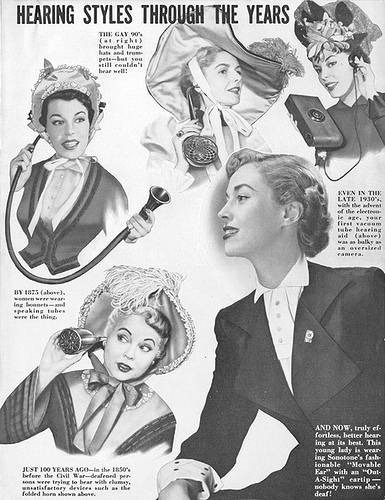 These new electric models were useful for people with severe hearing loss, but they were quickly made obsolete by the invention of transistor hearing aids in the 1950s. From the 1950s onwards, transistor hearing aids and hearing aid batteries got smaller and smaller. Between the 1950s and 1980s, transistor aids developed into four progressively smaller styles – those worn over the ear; in the ear; in the ear canal; and finally, a device small enough to be worn completely hidden inside the ear canal. The 1990s saw the development of digital hearing aids – including Siemens hearing aids. These devices were of similar size and construction as regular transistor hearing aids, but they provided for clearer sound quality. Cochlear implant technology has existed since 1980s, with the first successful implant surgery performed in 1972; in 2000 the FDA allowed for the use of the technology from age 12 months and up. Hearing aid reviews can help to differentiate between the various models of hearing aid available today, but it is clear from a quick historical review that hearing aid technology has come a long way from its humble beginnings.